Internists, Family Practitioners, Infectious Disease Clinicians, Nurses, Nurse Practitioners, Physician Assistants, Social Workers, Counselors, Pharmacists, Case Managers and other allied health professionals practicing in the area of HIV. Articulate a variety of providers' perspectives on HIV treatment priorities. Improve the management of viral hepatitis and other liver morbidities. Address co-morbid conditions in people living with HIV, including metabolic, renal, and psychiatric disease. Tailor communication and treatment strategies for underserved populations at risk for, or living with, HIV and/or viral hepatitis. The Johns Hopkins University School of Medicine designates this live activity for a maximum of 13.25 AMA PRA Category 1 Credits™. Physicians should claim only the credit commensurate with the extent of their participation in the activity. 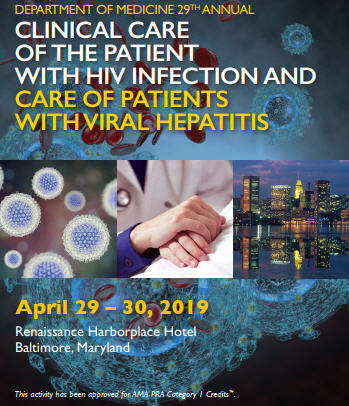 This Live activity, 29th Annual Clinical Care of the Patient with HIV Infection and Care of Patient with Viral Hepatitis, with a beginning date of 04/29/2019, has been reviewed and is acceptable for up to 12.75 Prescribed credit(s) by the American Academy of Family Physicians. Physicians should claim only the credit commensurate with the extent of their participation in the activity. American Academy of Nurse Practitioners National Certification Program accepts AMA PRA Category 1 Credits™ from organizations accredited by the ACCME. Maryland Board of Pharmacy credit is pending approval. National Commission on Certification of Physician Assistants (NCCPA): PAs may claim a maximum of 13.25 Category 1 credits for completing this activity. NCCPA accepts AMA PRA Category 1 Credits™ from organizations accredited by ACCME or a recognized state medical society. The Johns Hopkins University School of Medicine is authorized by the Maryland State Board of Examiners of Psychologists as a provider of continuing education. The Johns Hopkins University School of Medicine maintains responsibility for this program. A certificate for 13.25 CEUs will be awarded upon completion of this activity. Successful completion of this CME activity, which includes participation in the evaluation component, enables the participant to earn up to 13.25 MOC points in the American Board of Internal Medicine’s (ABIM) Maintenance of Certification (MOC) program. Participants will earn MOC points equivalent to the amount of CME credits claimed for the activity. It is the CME activity provider’s responsibility to submit participant completion information to ACCME for the purpose of granting ABIM MOC credit. Please make your reservation online.